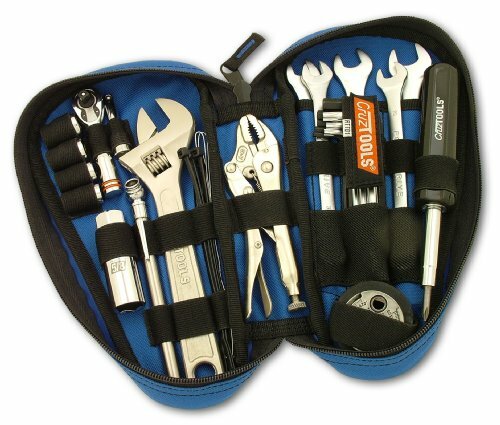 The RoadTech tool kit series combines road-proven EconoKIT content with a nifty mini ratchet and socket set. Softail riders can now get in on the action with the new RoadTech Teardrop which packs virtually everything from the RoadTech H3 into a compact pouch designed to fit genuine and aftermarket teardrop tool boxes. While the pouch is designed for teardrop boxes, the tool set is equally applicable to all air-cooled models. Includes the top-grade PowerDrive combination wrenches, an adjustable wrench, locking pliers, tire gauge, hex and star wrenches, screwdriver and more. But you will also love the mini ratchet and socket set, making this the last tool kit you' will ever need to buy. If you have any questions about this product by Cruztools, contact us by completing and submitting the form below. If you are looking for a specif part number, please include it with your message.